Physical characteristics: Mauritius cuckoo-shrikes measure 8.7 inches (22 centimeters) long and males weigh about 1.5 ounces (43 grams). Males have gray upper bodies, dull white undersides and blackish wings. 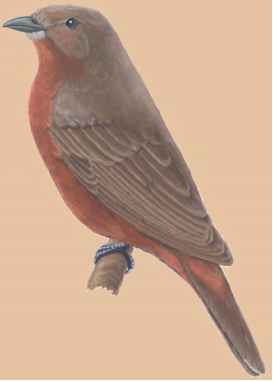 Females have orange-brown upperparts and reddish orange undersides. Geographic range: Mauritius cuckoo-shrikes live only in areas of southern Mauritius, an island off the southeast coast of Africa. Habitat: This species of cuckoo-shrike prefers the canopies of Mauritius's moist tropical evergreen forests, especially at elevations above 1,500 feet (460 meters). However, they will also use nearby forest that has been degraded or altered by humans. Many of the mating pairs may be found in remains of native forests around Black River Gorges and in the Bel Ombre Forest. Diet: Mauritius cuckoo-shrikes eat mostly large arthropods, invertebrate animals (animals without backbones) with segmented bodies, such as caterpillars, stick bugs, beetles, and praying mantids. They occasionally prey on small reptiles such as geckos and even steal the eggs of other birds, particularly the pink pigeon. The birds find their food mainly by searching through vegetation. Behavior and reproduction: Generally secretive and solitary birds, Mauritius cuckoo-shrikes live alone or with their mate. Males are territorial even outside of breeding season, which occurs during the rainy period from September to March. Both sexes work together to build a shallow, cup-shaped nest made of fine twigs, lichen, and spider webs, which they place high on a horizontal tree branch. 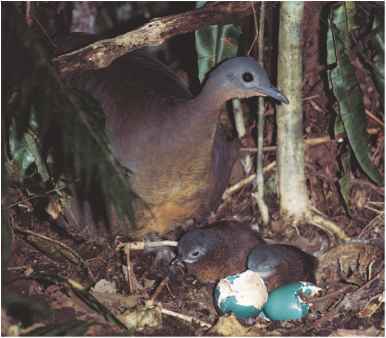 The female lays a clutch of two eggs, which both parents incubate for twenty-four to twenty-five days. Rat predation is a major danger for chicks. Males sing with a melodic trill and have a harsh species-specific call-note. Mauritius cuckoo-shrikes and people: Since 1975, many residents of Mauritius have helped to stop the decline of the bird's population through support of programs to restore native ecosystems and habitats.